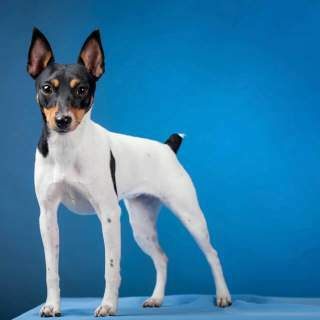 The most quoted description of the Toy Fox Terrier remains unquestionably true-- "a toy and a terrier". Elegant, clean and companionable combines with bright, alert and amusing to create a Toy dog you would be hard pressed to beat. Toy Foxies are low maintenance grooming, easily exercised and highly trainable! They are alert guardians that bark mostly when necessary and will do just fine at home while you go about your daily duties. Although they may remain aloof towards strangers they make excellent additions to multi pet households and are very good with older children. Competent in all activities, whether hunting or serving as a therapeutic companion for the elderly. Your TFT will be around for 12-16 years due to the unusually good health they experience for a toy breed. Toy Fox Terrier owners and TFT breeders agree that this is the best of all toy breeds. In looks, she is elegant, squarely and sturdily built with a short and glossy, low maintenance coat. She has a bright mind that allows her to be versatile, easily trainable-- a true loving companion. Her temperament is part amusing and curious terrier, part loyal guardian, and part cuddly couch potato. To sum it up, TFTs are dogs of many contradictions but they are pleasant surprises. Mini Foxies are very intelligent and excel in obedience and agility training. They are perfect for first time owners and are often said to be especially good for the elderly. Like many toy breeds, they are capable of developing nuisance behavior if treated like a child. If trained and socialized early they will be social with other pets, playful with children and tolerant of strangers. They also have loyal traits that make them natural guardians and even hunting partners. This breed has many pleasant and amusing quirks about them. They will soak up attention like a sponge, often observing you first to make sure you're watching before they do something funny; they easily make impressive trick performing machines! Another amusing fact is, that for whatever reason, they detest being wet and will not appreciate being thrown in the pool or let out in the rain. A surprising tidbit.. they are not overly vocal, usually barking when you need to be alerted of something. While not a considerable exercise buddy, your Mini will need moderate daily exercise. Take care not to exercise them in very cold weather since they are sensitive to these low temps. They also don't care for being wet so swimming and walking in the rain are out of the question. As to what they do like, there are so many possibilities! Hunting, games with toys, short walks, trips to the dog park, agility training, obedience training and just plain ol' playtime in a fenced yard will all work to take care of his exercise needs. 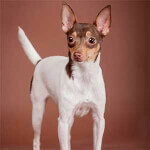 The Toy Fox Terrier is certainly one of the most impressive toy dogs. He is elegantly tiny yet has all of the terrier tenacity and strength of bone. Members of this breed are healthy and possess an aura of effortless agility and endurance due to their lightly muscled frames. Toy Foxies have heads that are always described as "elegant" with very large (in proportion) ears that are v-shaped and erect atop the head. The large, round eyes are wide set and exude a bright alertness and curiosity so characteristic of terriers. Overall, their bodies are equally long as tall. The tail is set high and is often clipped short by breeders (although we do not condone or recommend this). If not shortened, the natural tail is long and glossy haired. The smooth, shiny coat of the TFT is short and fine but slightly longer around the neck. The They are usually more than 50% white with a solid colored head of black, tan or chocolate (see coloration for specific combinations). White, black, and tan- Body is more than 50% white with a mostly black head; there may or may not be black spots on the body. Tan markings are present on the cheeks, lips and eye dots. White, chocolate, and tan- Body is more than 50% white with a mostly chocolate head; there may or may not be chocolate spots on the body. Tan markings are present on the cheeks, lips, and eye dots. White and black- Same as above but without the tan markings. Sometimes this breed will display ticking on the body that shouldn't descend past the elbow. There can also be white and chocolate individuals, however, they are not considered a preferable or standard combination for those that plan to competitively show their pet. Toy Fox terriers are very small dogs that are perfectly sized for small living spaces. They usually weigh in at a whopping 3.5-7 pounds and stand 8.5-11.5 inches tall, even when fully grown. If you plan on crafting your TFT into a show dog, the AKC preferred height is between 9-11 inches at the shoulders (withers). This is considered a pure breed and, as such, variations in true TFTs will be slight. The Toy Fox Terrier has a fine, smooth and shiny coat that is short all over the body but slightly longer in the neck region. Those seeking a long haired or wire haired member of this breed will be disappointed, as these coat types are not standard to the breed; you may be able to find mixes with these coat types at local shelters and adoption agencies. Describing the personality of this breed cannot be done without contradictions. Although Mini Foxies are very loyal and alert guardians of their families, they are notably friendly and outgoing. They are both amusing firecracker and cuddly, doting lapdog. However, it is important to remember they are both terrier and toy dog-- meaning, they are tenacious, stubborn, very intelligent PLUS capable of small dog syndrome! Obedience training should take place as early as possible and, although you may want to, avoid treating them like a small child. Overall, these toy terriers are great for any owner (young or old) except for those with very small kids that may engage in rough play. 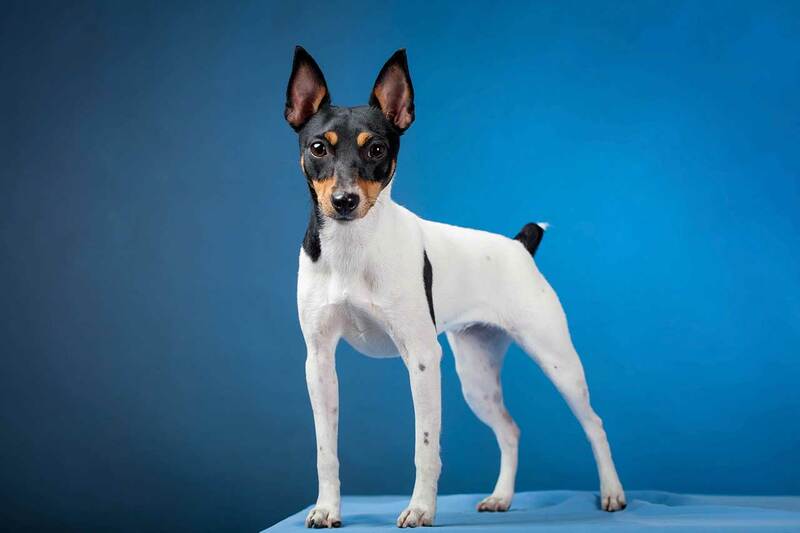 This keen and eager intelligence is a key component of the Toy Fox Terrier temperament. They are highly trainable and treats, praise and variety during training will go a long way to tame their terrier temperaments. These dogs are also known to house train easily making them excellent choices for first time owners. Socialization should take place very early in the Mini Fox Terrier's life for, although they are friendly and social towards other pets, they may be stand offish towards strangers due to their intense bond with the family. They make excellent watch dogs, as they are constantly on the alert (both out of curiosity and love for you). Amazingly, this is a toy breed that can be left alone for normal daily activities such as work and school without issue. Another big bonus with this breed-- they are not very vocal unless alerting you to something they deem important. They are bright enough to keep themselves occupied if left in the yard with playmates or with toys; they enjoy exploring every inch of everything! Upon your arrival home they will greet your with an abundance of love-- they thrive upon your attention and will act like little clowns but can also cuddle up with you on the couch. These dogs will adore older children than have been taught to respectfully handle pets, however, it is not guaranteed they will tolerate rough play from small children. 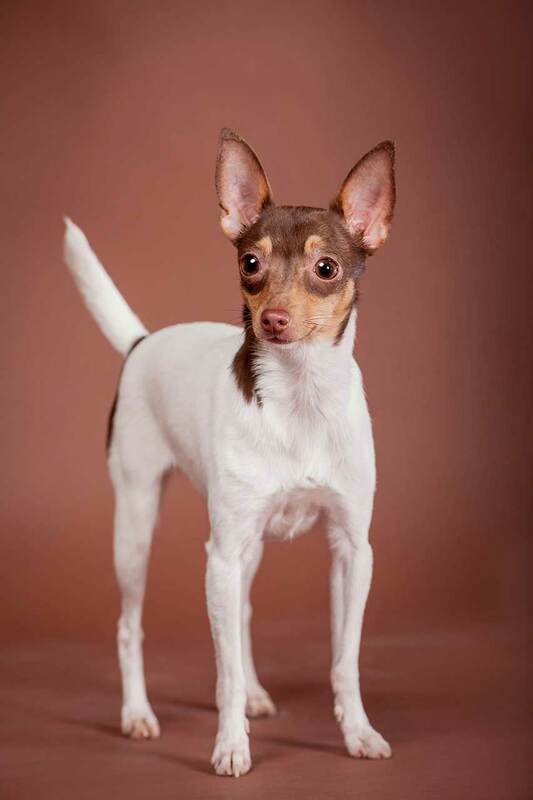 Below are pictures and images of the Toy Fox Terrier dog breed. You can expect 12-16 years of happy times with your Mini Fox Terrier. Sometimes they will be curious and amusing, other times they will be cuddly, and still sometimes they will loyally and tirelessly guard your home. One major plus for this breed is, although they adore attention, they will be fine while you go about your normal daily activities. In fact, if they are properly trained, they can and will accompany you on your travels. Barking is also not a problem for this breed, unless they feel they need to alert you, they are not considered a loud or yappy breed. While a fenced yard will be appreciated, it is certainly not a requirement. These little dogs are well suited to apartment living and should not spend the majority of time outdoors where is is cold. Owners and breeders also say these pups detest being wet! Members of this breed need moderate exercise which can include hunting, obedience and agility training, walks, the dog part, playtime in a fenced yard, games and toys; they also will thrive in the attention from older kids and play with them for hours. There is really no age restriction that would not get along wonderfully with this breed except for very small children that are not of age to be taught how to respectfully handle a pet. In addition to being a hardy dog for a toy breed, they require very little grooming maintenance. Their short, glossy coat would benefit from a weekly brushing to remove dead hairs, and the occasional bath will be necessary. As with every breed, a regular maintenance routine will be beneficial, clean the ears and teeth at least weekly and trim the nails when they appear to need it (immediately so if you can hear them "clicking" on the floor). Although little is needed to maintain a Toy Foxie's effortless elegant and clean looks, they are not a hypoallergenic breed. Demodicosis- skin disease (mange) caused by mites that infect the hair follicles. This will cause patchy hair loss and is sometimes associated with and indicative of other diseases in the body. Von Willebrand's- inherited disorder that results in abnormal bleeding; especially important during surgeries. Legg-Calve-Perthes- deterioration of the femoral head (bone in the leg) that presents similarly to hip dysplasia. You may have read about Congenital Hypothyroidism with Goiter, however, puppies with this disease will not survive past two weeks so this will not be a concern for those adopting or purchasing a puppy. The best way to adopt or purchase a healthy pet is to do your research to find a reputable breeder; some offer certifications and health guarantees.